Sleep is associated with many beneficial brain processes, including the strengthening of synaptic connections that correspond to memories and learnt material, and the clearance of potential neurotoxic proteins. As we get older we have a general tendency to sleep less. Previous work in our lab has demonstrated an important link between self-reported poor sleep quality and accelerated brain atrophy in widespread regions across the cortex, indicating that brain atrophy may be a cause or a consequence of sleep problems as we age. The accumulation of a peptide known as β-amyloid (Aβ) is perhaps the most established biomarker for Alzheimer’s disease to date, as its occurrence often predates cognitive decline in the ageing brain. Evidence also suggests that Aβ accumulation links with problems sleeping. In a new study, LCBC researchers used measurements of Aβ and other established Alzheimer’s biomarkers taken from the cerebrospinal fluid—the clear liquid encasing the brain and spinal cord—together with measurements of brain atrophy, memory and depression, to test whether these predicted sleep problems in cognitively healthy older adults. Results indicated that higher levels of a biomarker associated with degeneration in the brains axons, Tau, and a marker associated with neuroinflammation, YKL-40, predicted sleep problems, only in healthy adults with Aβ. Poor sleep quality was also uniquely related to poorer memory functioning, higher depression scores and more extensive brain atrophy. The findings underscore the importance of understanding the role that sleep plays in age-related brain- and cognitive changes that are associated with pathology and increased risk for Alzheimer’s disease. Older adults tend to vary considerably when it comes to performance on certain mental tasks; some older individuals perform very well while others perform quite poorly. However, we know that a person’s cognitive performance in later life tends to be somewhat similar across various mental tasks, such that high performance in one cognitive domain tends to accompany high performance in others as well. Older people also vary widely to the extent that they are able to cope with the brain changes that are occurring during the aging process, and to what extent they impact upon behavioural performance. Aging research has therefore inferred that the extent of cognitive decline seen in aging is also determined by factors present before the onset of old age, a concept known as ‘brain reserve’. This concept is backed-up by research showing that people with higher levels of education show equal Alzheimer’s-related brain pathology as lesser-educated people. However, higher education is associated with less cognitive decline despite the presence of equal Alzheimer’s-related brain pathology. If earlier factors (such as education) can help protect against cognitive decline in aging, then this suggests that in order to truly understand the brain aging process, we need to go further back in time. We at LCBC are among those who take this idea the furthest, arguing that the aging process needs to be considered against the backdrop of the entire lifespan, in which both development and aging are considered as one long, undivided and continual process. With this view, factors apparent very early in life (such as birth weight) should also impact upon brain aging. In LCBC’s latest paper published in the prestigious scientific journal Proceedings of the National Academy of Sciences of the United States of America, the authors tested whether brain measurements that relate to one’s general cognitive ability (GCA) during development (i.e. 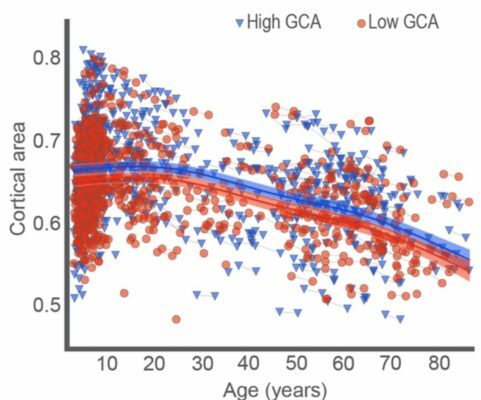 at less than 12 years of age) could predict later changes in GCA from in later life, and whether early life factors could predict the life trajectory of brain-cognition relationships. It was found that cognitive ability during development was associated with cortical area across much of the brain, lending support to the idea that general mental performance is made possible by the coordination of large-scale brain networks. Later brain changes for children scoring higher in GCA were then tested against those for lower-scoring children, revealing a parallel change trajectory for both groups (below figure). This suggests that early life factors may exhibit a continued influence on later brain changes. Further analyses revealed that one’s birth weight and the education level of one’s parents also predicts the trajectory of brain-cognition measurements occurring later in life. In sum, the paper shows that the relationship between brain measurements and cognitive scores appears to be remarkably stable throughout life, and that factors apparent from birth impact upon the aging process. Throughout life the human brain is constantly changing and modifying itself to adapt to the changing demands of the environment. This so-called cognitive plasticity is an inherent characteristic of the brain that essentially reflects one’s ability to learn. Older individuals tend to vary substantially to the degree that they show improvement through cognitive intervention and therefore document varying degrees of cognitive plasticity. Indeed, older individuals tend to be characterised by great variability in terms of how much they may benefit from mental training. This underscores the need to understand both the brain mechanisms that predispose older individuals to benefit greatly from mental training, as well as the brain mechanisms underlying the inability to benefit from such training. 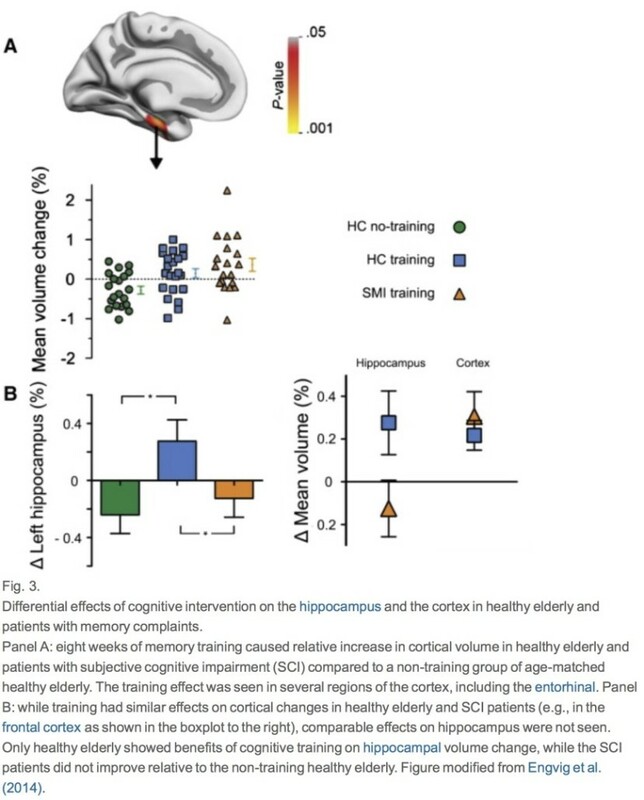 In our latest research paper we conceptualised cognitive plasticity as the extent to which older individuals benefited from a memory training intervention. For some years our group has been running an extensive training study (see NCP project) where our participants have undergone either intensive memory training to remember word lists, or been assigned to a control group that received no specific memory training. During memory training participants learnt to use a technique known as the Method of Loci, whereby in order to memorize a list of objects in sequential order one must visualise each of the objects and mentally place them along a familiar route. By this method, each object to-be-remembered becomes associated with a particular location along a journey, and this enables easier recall. Participants underwent MRI scans at the onset of the intervention, and every ten weeks during the study. As predicted, only the group that underwent memory training had shown an improvement in memory score by the end of the study period (above figure), demonstrating our memory-training paradigm to be effective. In the brain’s white matter tracts it was found that relative to older adults, younger adults tended to show a greater degree of white matter integrity (as inferred by diffusion measurements of molecular motion) across many regions of the brain. In addition, the analysis led to the identification of 3 specific areas of white-matter that related to the degree of memory improvement from the training we administered (below figure). 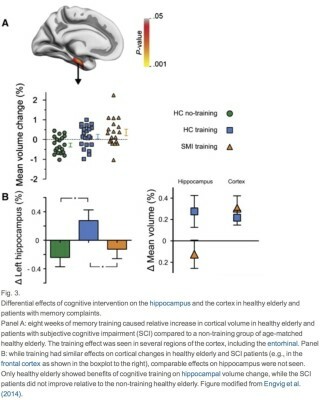 This was the key finding, as it indicates that individuals with a lager degree of white matter microstructural integrity as measured before the training period, benefitted more from the training and thus were able to improve their memory scores to a greater extent.Therefore the integrity of the brain’s white matter tracts could be a potential marker for one’s ability to adapt in response to cognitive demands during ageing. The two hemispheres of the brain are connected by an extensive bundle of nerve fibers known as the corpus callosum. This enables neural information both to be exchanged and shared between the two halves of the brain, or possibly delegated to a greater extent to one hemisphere more than the other. If the corpus callosum is impaired in any way then there will be a concurrent lack of inter-hemispheric communication and a large mental deficit. Therefore corpus collosal development represents a crucial step in healthy brain maturation in children; the structure typically shows a growth spurt during the first 2-3 years of life, achieving adult-like levels of function by middle to late childhood. However, all previous research examining the structural development of the corpus callosum in middle to late childhood has also included adolescent children and even young adults. Therefore the results of these previous growth studies will have been swayed by the inclusion of older children, and the statistics are likely to be more representative of older children given their often greater number. In a recent paper LCBC investigated corpus callosal growth for the first time using a sample exclusively composed of children in middle to late childhood (aged 4-11 years), using brain scans from 428 children (approx. 50% gender split) with follow-up scans from 304. The team found that the corpus callosum of children shows significant increases in thickness relative to overall brain size (i.e. after taking into account the fact that overall brain size increases during development) between 4-11 years. The growth rate found amounted to a 0.19mm growth in thickness per year in posterior regions (see top image) where the age effect was strongest. 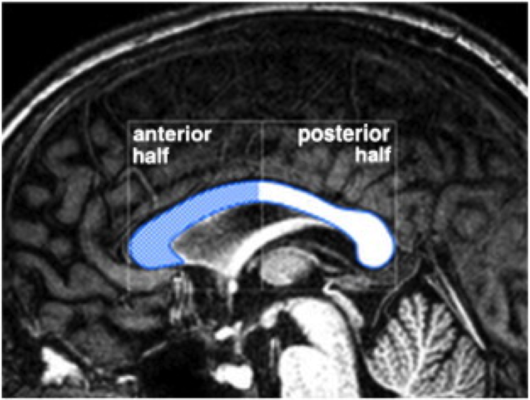 This higher growth rate of the posterior part of the corpus callosum agrees with development research in general; it is known that the more posterior parts of the brain (visual and sensory areas) mature faster than anterior regions, and the posterior half of the corpus callosum links posterior brain regions. 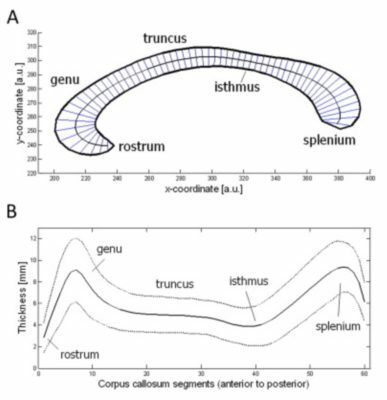 It therefore makes sense that we observed a more pronounced growth spurt in posterior corpus callosum, simply because brain changes associated with maturing visual and sensory systems are among the first to occur in young children. Thus this region-specific thickening of the nerve fibers connecting these systems is likely an effect of maturing sensory brain areas. Westerhausen, R; Fjell, A. M; Krogsrud, S. K; Rohani, D; Skranes, J; Håberg, A & Walhovd, K. (2016). Advanced mental functions rely on large-scale networks of communicating brain cells, and the coordination of information from widespread regions of the brain. It has been proposed that the communication-efficiency of these networks is something that declines as we age, and that this may help to explain phenomena such as slowing reaction times with advanced age, as well as degradation of so-called higher-order mental functions. To test the hypothesis of a more ‘disconnected brain’ with greater age, we followed 119 young, middle-aged and older (63+) participants with repeated brain scans and took measurements of brain connectivity between cortical grey-matter regions while at rest (functional connectivity), as well as measurements of white-matter tract integrity (structural connectivity) — the major information highways in the brain composed of bundles of myelinated axons that allow far-flung cortical regions to connect. We also tested participants on a well-known attentional control task. This task is known to heavily recruit frontal brain regions that are more associated with higher-order mental abilities; patients with damage to such brain regions tend to perform poorly on this task. We found that executive higher-order cognitive functions showed a clear decline with age over time, and this was to a far greater extent than other, more basic mental functions. 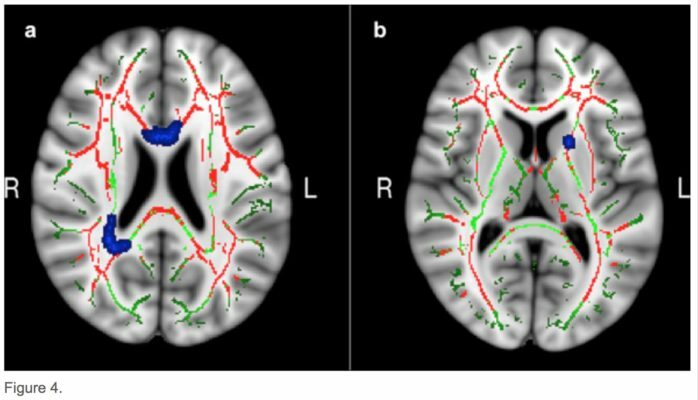 MRI-derived measures of brain structural and functional connectivity were both found to relate to this reduction in executive functioning between the two test time-points, and 82.5% of the age-related decline observed in our study could be explained by connectivity changes over time. As a caveat it should be noted that all aging research is inherently flawed because it involves quantifying changes from one time to another whilst allowing the influence of time to take it’s natural course. Therefore, since age and time cannot be subjected to experimental manipulation, our results are correlational in nature and therefore do not allow us to draw causal conclusions. Nevertheless, we believe our results may support the view that as we age, the human brain becomes more ‘disconnected’, and this appears to happen in concert with a decline in higher-order mental functioning. Fjell, A. M; Sneve, M. H; Grydeland, H; Storsve, A. B. & Walhovd, K. B. (2016). https://www.oslobrains.no/wp-content/uploads/2015/11/Premises_of_plasticity_And_the_loneliness_of_the_medial_temporal_lobe.jpg 1080 869 James M Roe https://www.oslobrains.no/wp-content/uploads/2017/09/LCBC_wide_full-800x168.png James M Roe2015-11-09 16:14:162018-02-15 08:34:28What determines brain plasticity?